Hello everyone, welcome. 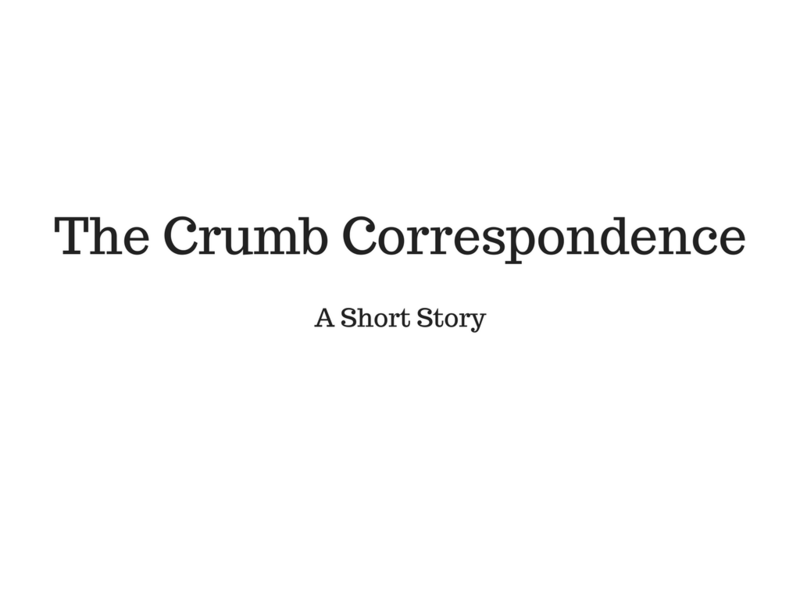 Today I decided I would share another one of my short stories, this one a comedy called The Crumb Correspondence. Aside from anything else, I think it is probably good to let people know that not everything I write is grim or depressing! The following is an Epistolary which, if you are unfamiliar with the term, is a collection of correspondence, letters and journals. A good example of a famous Epistolary is Bram Stoker’s Dracula. The Crumb Correspondence is a collection of letters written by the protagonist, and in the near future I will be sharing a post discussing some of the lessons I have learned that made this story possible. So, without further adieu, The Crumb Correspondence. I hope you enjoy. I met my neighbour yesterday, Harry Hough. He owns the butcher shop, which he has decorated with a sign outside in the shape of a knight, holding a large meaty shield. He calls his shop ‘Sir Loins’. You’ll never see me doing anything so crass with Crumb’s Cakes! I went to church with my assistant, Mrs Bickerstaff, on Sunday. She introduced me to the congregation, and then to Reverend Bletherington. He is as talkative as she is nosey and impatient. I invited him to my shop for tea (Mrs Bickerstaff rightly agreed to brew). He was a pleasant enough fellow; he even blessed my shop and all its contents. It seemed a bit odd at the time, but apparently he does that with all new members of his parish. I did not hear exactly what he said. Mrs Bickerstaff was too busy slamming doors! Flour! I may have spoken too soon about my new home! I was out exploring, sloshing through muck, sludge and soot when I took a wrong turn into an alleyway and was set upon by a glut gaggle whored group of iniquitous women selling themselves! I honestly believe that these creatures, the vile bloodsucking leeches on the throat of society, sleep in those refuse piles at the end of the street. They are filthy, stinking and their language is most vulgar indeed. I gave them a piece of my mind, but that just turned them savage! Fortunately, I was saved from the harridans by the intervention of Baron Von Contele, a visiting nobleman from Eastern Europe. Contele appeared as if from nowhere, and I can honestly say he was the most imposing gentleman I have ever seen in his black cape, top hat, spectacles and cane (Quite fashionable, I might say). His voice was melodic and harsh at the same time, causing the tawdry temptresses to flee before him. I was most impressed. Undoubtedly, they returned to whatever refuse pile they crawled from. The Count introduced himself, and when he found out who I was, he invited me to feast at Blackmoor Hollow, with the Mayor and several other prominent gentlemen. I was pleased to accept. Midden. Noun. Collective term for a group of iniquitous women, intent on proposition. ‘The virtuous man was surrounded by a midden’ or ‘He was besieged by a midden of strumpets’. The feast at Blackmoor Hollow was splendid. The mansion was tastefully decorated, mostly in red, with the finest tapestries, paintings and furniture, significantly contrasting with the rivers of filth that flow just down the street from my shop. That Darwin fellow had it wrong. Not all creatures are products of the gene pool, more like cess pool. Gads! It seems the Baron shares my distaste. He spoke at length with the Mayor and Inspector Habberdash about aggressively tackling vagrancy and middenry. The rest of the night is a bit hazy. Probably the wine. The Baron serves a fine red. Things appear to be picking up. I was accosted by a midden today; the harlots followed me to my shop and threw things that can only be described as stinking and wretched (perhaps what remains of their virtue?) at my window. Their slimy bombardment was terminated by a most timely intervention by the local constabulary. Things are changing; the best I could get out of Habberdash previously was a suggestion to post a notice outside my door. To the Vile Bloodsucking Leeches that prey on the jugular of society, I say to you one thing. You are not welcome on these premises. Stay out! You are absolutely not invited. You have not been at work for several days, and you were not in church on Sunday. Indeed, half the congregation was missing. Some strangers, Dutchmen I think, appeared halfway through the service. They appeared to be led by a man with a bushy beard and wild grey hair mashed beneath a wide-brimmed black hat, a silver buckle on the front. The cheeky foreigners were filling their canteens from the baptismal font. Please inform me when you will be returning to work. If it had not been so quiet the last few days, I would not have managed. I cannot believe it! The harlots stopped me in the street just last night and apologised! And…they had washed and were no longer wearing clothes that looked like a beggar’s leavings! They escorted me home saying a pillar of the community like me should not go unescorted. Oddly, when they got to my shop, they appeared to be startled and fled. I hope they get home ok. The constables apparently found a dead vagrant two streets over. White as a sheet and rumour has it some kind of neck wound. I hope it isn’t an escaped bear. You always hear about escaped bears. Very strange situation today. The Dutchmen came into my shop. Their leader (the man in the hat, whom the others called Professor) asked me where he could purchase steaks, so I directed him to Sir Loins. I just hope they don’t get heartburn. As a member pillar of the community, I feel it is my moral obligation to bear witness to a crime. A young woman, formerly of iniquitous repute, whom I have learned goes by the name ‘Belle’ was set upon by a villainous rogue in an alleyway adjacent to my bakery. I am ashamed to say he was a customer just yesterday evening. He is a Professor from somewhere in the Netherlands. I threw myself boldly heroically into the fray, knocking the cross from his hand, and punching him in the jaw allowing Belle to escape. The Professor left in a hurry when I saw one of your fine constables and alerted him. It has been a strange week. I have had a bad cough and the streets have been more or less empty during the day. My shop is the only one still open. There are a few people going about at night, but none of them come anywhere near my door. I saw the Professor and his men pass by the shop earlier, heading towards Blackmoor Hollow. They were carrying torches, and spears. Perhaps the Baron is having a Hog Roast? The Professor reappeared an hour later, with just one of his men. The two gents hurried into my shop, slamming the door. Flour was sent everywhere. I looked paler than Belle (Too much makeup one assumes), whom I had seen following the gentlemen up to the house earlier. Their clothes were now ripped and they were bleeding all over my floor! Perhaps the Baron had supplied a live pig for sport and food, and the pig won. The Baron promptly arrived, presumably to offer apologies and assistance to the injured men. He glared disapprovingly at my sign. I assured him that I didn’t mean him, and that he should come in. The Professor and his companion fled into my back room, slamming the door (Again!). And then the Baron took a funny turn; his face turned red and his hands grasped clawed at his throat. He even coughed up blood. It was like when Uncle Jock thought he had accidentally swallowed a penny! The poor chap doubled over and collapsed. The Professor returned, and tried to give the Baron a drink from his canteen, but that just made him choke. The Baron was pronounced dead on my shop floor soon after. Perhaps he had some form of consumption? Sad times indeed.